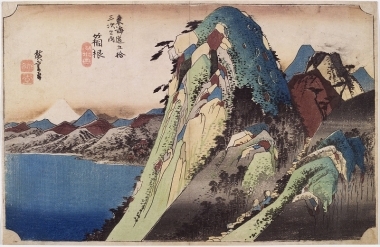 Hiroshige’s woodblock print series known as Fifty-three Stations of the Tokaido depicts scenic locations along Japan’s Tokaido Road as they appeared in 1832 when Hiroshige traveled the thoroughfare on foot. The Tokaido was Japan’s eastern highway linking the cities of present-day Tokyo and Kyoto. The exhibition was organized by the Reading Public Museum, Reading, Pennsylvania. Exhibition support is provided by Chester & Karen Opalka, Mr. and Mrs. Paul V. Bruno, Mr. and Mrs. James Featherstonhaugh, Mr. William M. Harris and Ms. Holly A. Katz, Donna and Fred Hershey, Richard and Karen Nicholson, Martha Waddell Olson, Sara and John Regan, Bart and Patricia Trudeau, Trudeau Architects, Sabrina Ty and Brian Fitzgerald, and New York State Council on the Arts with the support of Governor Andrew M. Cuomo and the New York State Legislature.